In my different steps toward self-hosting, I switched from Google Calendar to Owncloud Calendar. However, one neat feature is missing in Owncloud, it's the ability to set task reminders. My schedule is not very busy, so I mainly put 'far-off' meetings and appointments ... and I forget to check the calendar again and miss the event! appears to be easily expendable, so the idea grew quickly in my mind, and today it's ready: I need to export the calendar in ICS format, parse it, and feed it to selfoss. I first thought about converting it to RSS, but I didn't want my events to be available online, so it was easier and quicker to jump directly from Owncloud to Selfoss. ICS is a well-define format, same luck, it wasn't hard to find a simple parser: ics-parser. Last step, and not least one, I had to feed to parsed ICS to Selfoss, through a "spout", a source plugin able to a provide new items to Selfoss. first, we tell selfoss what information we need to add a new calendar feed: the URL is mandatory, username and password are optional, "days in advance" tells for how many days in advance we want to fetch the events. 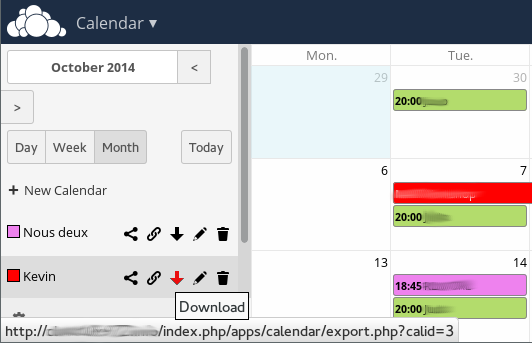 then we load the calendar, either from Owncloud or directly from its URL. If URL is "owncloud_", we load from owncloud, otherwise, we fetch the URL. Spouts implement the iterator interface, so here we prepare iterator, "rewind" it, and it's ready. other of the iterator. We count the distance in days, and only print it if it's below the threshold. Obviously, we also discard the past events. one kind of events were missing after the first try, it's the repeating events: "every Saturdays, starting the 18th of october". So far I only implemented weekly events, I'll add other kinds whenever I'll need them! that I concatenate the date of the day to the event ID. That means that every day, Selfoss will "think" that the event is new, and mark it as unread ... and there we are ! Actually, there is one more step I had to implement: my Selfoss feeds are public, I don't mind sharing what I read, but I don't want my calendars to be publicly available. So I hacked Selfoss to "hide" some items if the session is not authenticated. Easiest way: hide tags starting with a "@". Nothing very complicated, we just remove the unwanted tags from the lists !